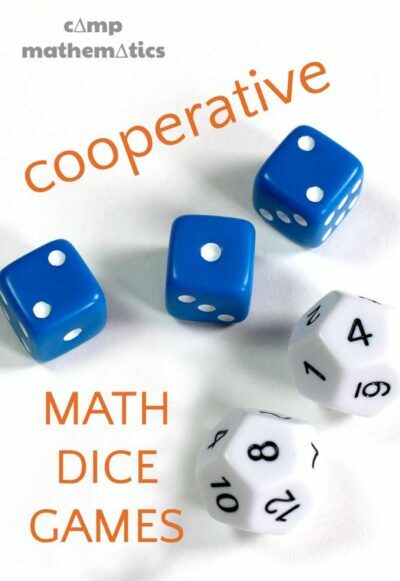 Math Dice Games Kids Can Play Cooperatively! You are here: Home / Learn / Math Activities / Math Dice Games Kids Can Play Cooperatively! We acquired a set of Math Dice a few years ago and my son loved playing with them but they have been languishing in the game closet for a while now so I thought it was time to bring them out for some fun math dice games during our final week of Camp Mathematics. We had quite a good time at the dinner table the other night playing games and coming up with some crazy equations! I realize playing math games during meal time is not for everyone, but I encourage you to try these math dice games with your kids to show them how fun math can actually be. We used Think Fun Math Dice for these games. The set comes with two 12-sided dice and three 6 sided dice. 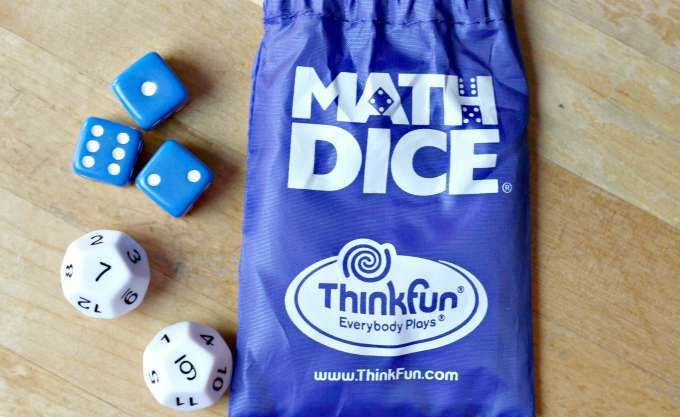 This game and its variations are based on the enclosed instructions for Think Fun Math Dice . Roll the two white, 12 sided dice. Multiply the two numbers. This is your target number. So for example, 8 x 3 = 24. 24 is the target number. Now, roll the three blue dice. Using the resulting numbers, players attempt to create as many equations as they can to achieve a number as close to the target number as they can. For example, 4, 4, 3. 4 + 4 + 3 = 11; (4 x 4) + 3 = 18; (4 + 3) x 4 = 28; (4 + 4) x 3 = 24; and so forth. Cooperative play: we took turns creating equations. If we thought we could do better than the three equations on the first round, we talked it out together to make up more equations. Add the two numbers instead of multiplying them. Create a 2-4 digit number with the two numbers. For example, a 12 and a 4 could be 124, or 412. MORE: We also love TENZI, a fast paced dice game. This game teaches simple addition as well as understanding probability. 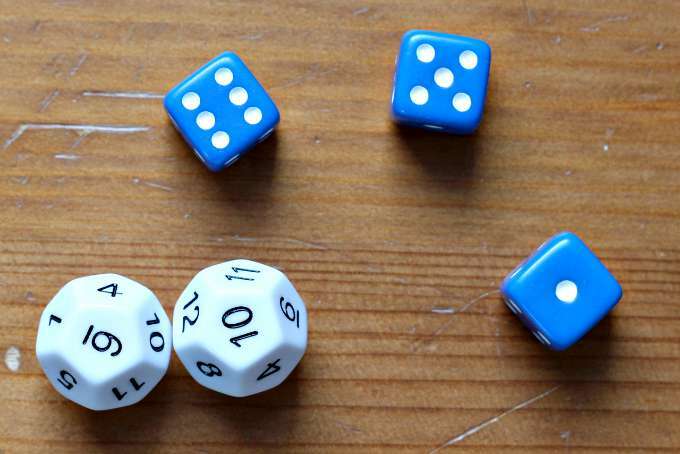 Roll the two white dice and use the numbers to create a new, larger target number of your choice (so, add or multiply as described for game #1). Taking turns players roll the three blue dice. After each roll, the numbers are added up. Players continue rolling, trying to reach the target number without going over. Players consult each other as to whether or not they should keep rolling. Variation: roll only 1 or 2 dice at a time. Please do not feel you can’t play this game if you feel “you are not good at math.” I am not a math teacher. In fact, the last time I had a formal math class, I was 16 years old. When I don’t know something I want my kids to see that I am willing to problem solve and apply growth mindset thinking in order to learn. In addition, I NEVER say “I’m bad at [insert subject here]” because I NEVER want my kids to think that about themselves. This is the final week of Camp Mathematics!! Are you sad? It’s been fun collaborating with Megan to bring you 6 weeks of ideas that you can use all year round, not just in the summer! Be sure to check out Megan’s ideas for simple math card games you can play with the kids. Each time we look for education games for our children, math dice may be a good selection. It not only helps increase their brain, but also keeps them always amused. Let your kids discover its game concept right now!